This entry was posted on Monday, January 1st, 2018 at 12:13 pm and is filed under animal crackers. You can follow any responses to this entry through the RSS 2.0 feed. Both comments and pings are currently closed. I was feeling so good about the new year. Last year’s mistakes are over! Today is the first day of my do-over! Then one hour into the new year I made my first mistake. I waited until 1am to send my west coast daughter a happy new year text, because her time zone is an hour behind mine. “Happt New Year to my Awesome Daughter !” my text said. Hey, the fact that you were lucid enough at that ungodly hour to hit “send” should count for something. My first flub of the new year: I left a pan full of alfredo sauce on a burner that I only THOUGHT was turned off. Oh no! Yikes! We all do those things. I’m so glad it did not cause a big fire!! So am I. Burning the house down would NOT be a good way to start the year. 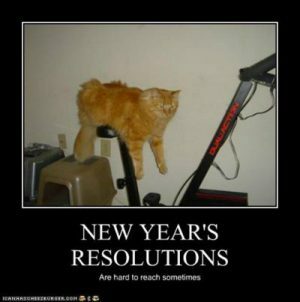 Some resolutions are harder to pull off than others!! Loved this post. Absolutely adorable! He he, these are really good resolutions.